With the UV-Vis Spectrophotometer you can measure the absorbance of a solution or a thin film. Therefore different sample holders are available. The absorbance of a thin film can also be measured under Nitrogen atmosphere in the glovebox next to the Spectrophotometer. 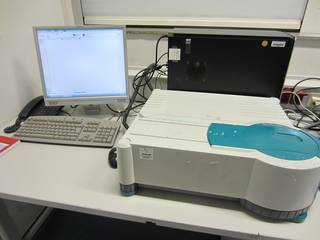 As a reminder the spectrophotometer is measuring the absorbance, which should not to be confused with absorption. The absorbance imply absorption, scattering, diffraction and reflection.